Now that Blu-Ray version of Iron Man 3 has hit retail shelves, it appears that e-Blue is once again trying to ride the wave of brand name recognition with another movie tie-in gadget. This time, instead of an shameless money grab they actually made a gaming mouse that actually has some merit to it. Like the Mark 42 model, the Auroza mouse looks like Stark’s yellow and red helmet, and is obviously meant to be marketed to Iron Man memorabilia collectors. This, however, is where the similarities end between the wireless Mark 42 and the all new wired Auroza. This is not a simple one trick pony; underneath the Iron Man 3 skin beats the heart of a very good optical gaming mouse. The Auroza has on-board DPI change switch which allows you to quickly scale from 500 DPI to the maximum sensitivity of 4000 DPI. Also, the Auroza comes with a very ergonomic design with highly textured surface as well as 6 well-positioned buttons which use high-end Omron mechanical switches. These even has a polling switch on the underside to quickly change from 125Hz all the way up to 1000Hz. 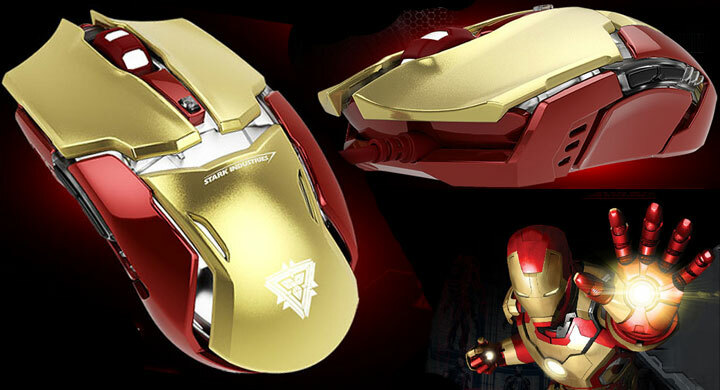 Taken as a whole, the Iron Man-themed mouse is everything the Mark 42 is not. If you are looking for a great blend of unique aesthetics and performance then this $73 USB wired mouse deserves a second look.